Ever want to dance in the Nisei Week Ondo and Closing Ceremony or Grand Parade? Join the Nisei Week Japanese Festival this year as it celebrates its 76th anniversary Aug. 13-21. To help the public prepare for the Grand Parade (Aug. 14) and Ondo/Closing Ceremony (Aug. 21), free public dance practices are being held from 6:30 to 9 p.m. on Tuesday, July 19; Thursday, July 21; Tuesday, July 26; Thursday, July 28; Tuesday, Aug. 2; and Thursday, Aug. 4 on the Japanese American Cultural and Community Center (JACCC) Plaza. The 2016 Nisei Week choreographer is Hanayagi Rokufukumi, who began her Nihon buyo career at a very young age under the tutelage of the late Hanayagi Rokumiye. After many years of study, she received her natori (rank and professional stage name). Born and raised in Southern California, she traveled to Japan to live and study dance. She mastered the requisite techniques and earned her shihan (teaching certificate) and senmombu degree (specialty instructor’s degree) from Grand Master Hanayagi Jusuke III. Upon her return to the U.S., she began teaching in the Los Angeles County area with the assistance of her mentor, Hanayagi Rokumiye. Together, they participated in the Nisei Week Japanese Festival events and performed at multiple venues throughout Southern California. Shortly after Hanayagi Rokumiye’s passing, Hanayagi Rokumine Sensei provided Hanayagi Rokufukumi the opportunity to be the co-leader in the Nisei Week Parade. They worked together to promote the cultural heritage of the Hanayagi School of dance. This year, she is honored to serve as the choreographer and leader of the Nisei Week Japanese Festival Ondo. The love of teaching and the enthusiasm generated by her students has allowed her to continue promoting traditional dance techniques and creative choreography infused with modern rhythms. Under her direction, Hanayagi Rokufukumi’s students continue to perform at many local community festivals, community events, professional venues, and nonprofit organization events. Presently, Hanayagi Rokufukumi teaches the Hanayagi-ryu style in Los Angeles and Orange counties. 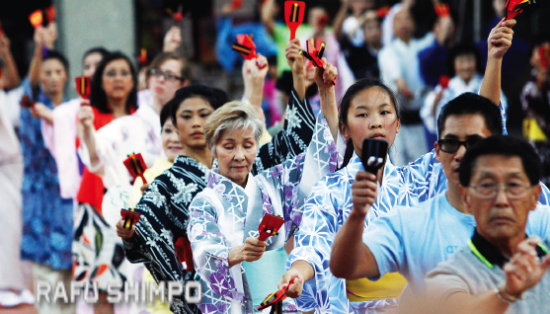 The Nisei Week Japanese Festival is a nine-day event first held in Little Tokyo in 1934, and is recognized today as one of the longest-running ethnic festivals in the United States. For a calendar of events, log on to NiseiWeek.org, call the Nisei Week Foundation office at (213) 687-7193 or email [email protected] The Nisei Week office is located at 244 S. San Pedro St., Suite 303, Los Angeles, CA 90012.